Climbing as a family is an outstanding way to spend hours together in nature while fostering an early love for the outdoors. Getting our family into rock climbing was a no brainer. We crave the outdoors and wanted to teach our children adventure. Sometimes, climbing and outdoor activities don’t always work as planned. Getting your kids outside while experiencing these challenging moments teaches them how to overcome obstacles and react when the world does not go according to plan. Climbing is something you can do at any age, making it the perfect outdoor family activity. Through climbing, we spend more time outdoors than ever before. Children are natural climbers and this gives them something other than your walls or furniture at home to conquer! I think my favorite part is that my kids’ wish lists have turned from ridiculous “It” toys to outdoor related gear and clothing. 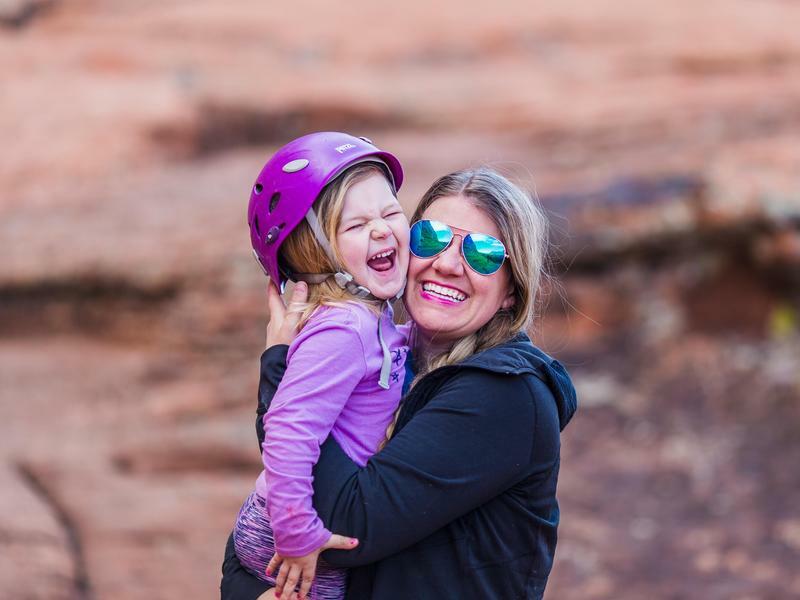 Getting your kids out in your local canyons and crags while they are young is the best time to instill stewardship, ethics, and respect for the outdoors in the next generation. Teaching your kids a love for nature is a catalyst for stewardship well into the future. Climbing is inherently tricky; if you don’t already climb it’s hard to know where to start. I always recommend starting at a climbing gym. I am a member of Momentum Climbing, but there are several other great gyms throughout Utah. While I always prefer climbing outside when weather permits, I know the gym makes me a stronger climber during the cold winter months, and kids absolutely love climbing gyms. The gyms offer belay certification classes where they will teach how to safely belay and show you the basics. You can rent all the gear you need to get a feel for climbing and if it is right for your family. As you progress as climbers you will eventually be able to take the test to begin lead climbing, which will give you the knowledge to safely transfer your climbing outdoors. Willing friends with solid climbing experience also make great teachers. Between books, internet forums and YouTube, there is a ton of information out there to help you become a well-rounded climber, as well as make you more aware of your impact in the fragile environments that we climb. This is where we spend the majority of our time. There are many kid-friendly options and it’s conveniently located with fantastic quartzite climbing. Big Cottonwood is so close to everything and has a crag for every climbing level. Multiple rock types with granite, quartzite, and limestone all in the same canyon. Like Big Cottonwood, Little Cottonwood is conveniently located, but is harder for kids and better suited for the more advanced climber. My kids are used to hanging out cliffside, but it’s not for everyone. Gorgeous red rock and sandstone for days, with climbing options for all levels. Moab is incredible, but as anyone living in Utah knows, it’s hot in the summer. Rocks radiate heat and no one wants to bake in the sun on a rock (we aren’t lizards!). To avoid the heat, we climb in Moab in spring and fall. It’s usually the first place we camp after winter and one of the last before it starts getting too cold. Incredible canyon with sand dunes, lava tubes and gorgeous views…and the climbing is great too! We just discovered Snow Canyon this year and fell in love. This Southern Utah destination is also very hot in summer, so it’s best suited for spring and fall, but it’s often warm enough to climb comfortably in winter months as well. So beautiful…we will definitely be back! Indian Creek is part of Bears Ears National Monument and has amazing splitter crack climbing on Wingate Sandstone. Indian Creek is easier for more established climbers and the approaches are definitely steep, but some of my fellow Mamas from the Adventure Mama Initiative and I managed to hike up with 3 toddlers in packs and were just fine. You are stronger and more capable than you think, I promise! Located near a sandy, dry lake bed in Utah’s west desert, Ibex offers a great range of quartzite climbing and is perfect for family camping trips. I am a huge fan of camping in sand…is there anything better than kids entertained for hours playing in the sand with buckets and shovels?! This is another location that is brutally hot in summer, so plan your adventure accordingly. 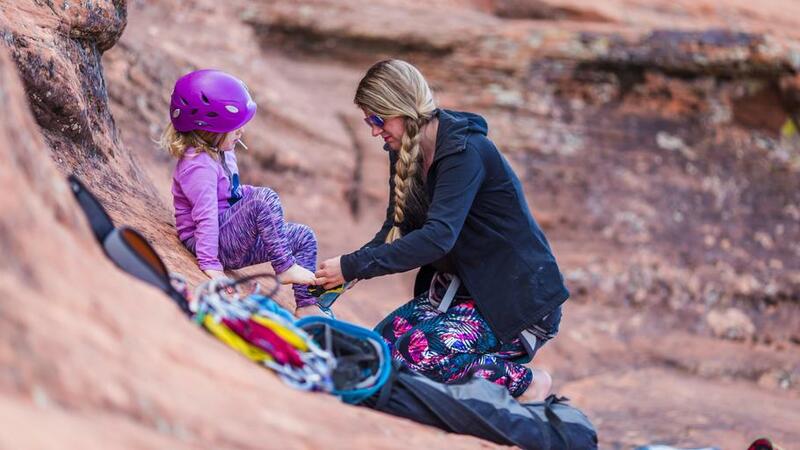 Getting outside climbing does require specific gear, and with kids that gear multiplies! If you are climbing in a gym, you can always rent what you need, but once you make the leap to the outdoors there are a few basics you should acquire. The bare necessities in terms of personal equipment each climber needs are: climbing harness, shoes, chalk bag and a belay device. This assumes someone in the group has a rope and the gear/knowledge to safely rig it. Sometimes the gear isn’t climbing related but just makes things easier for managing kids at the crag. 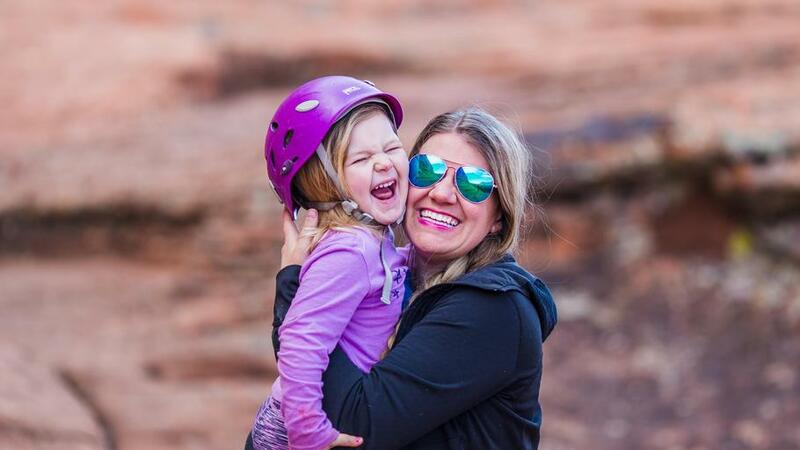 Amanda (@adventuringwithkids) is a native Utah mama of 2 little wildlings (10 and 4) and a Great Dane. 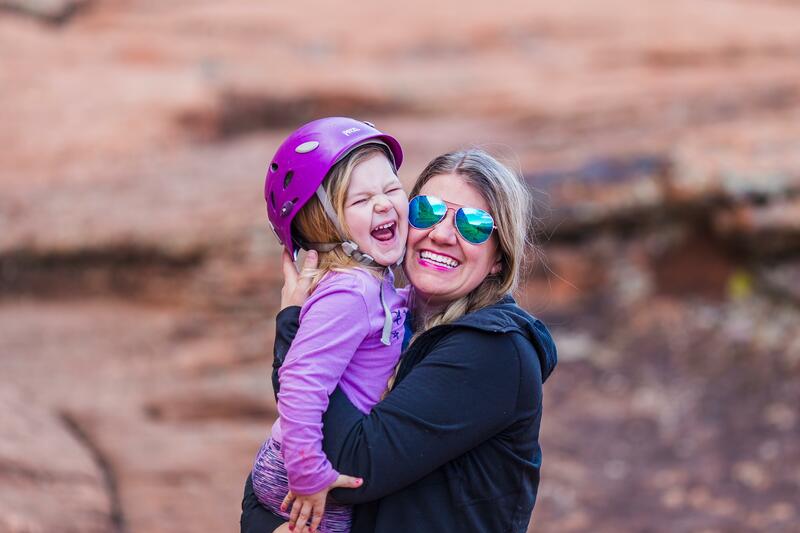 She can be found rock climbing and paddle boarding all over Utah. She is passionate about getting kids outside and tries to get her children outside every day in some capacity. She volunteers for Wasatch Little Explorers Club @wasatchlittleexplorersclub and hosts monthly hikes/meetups.